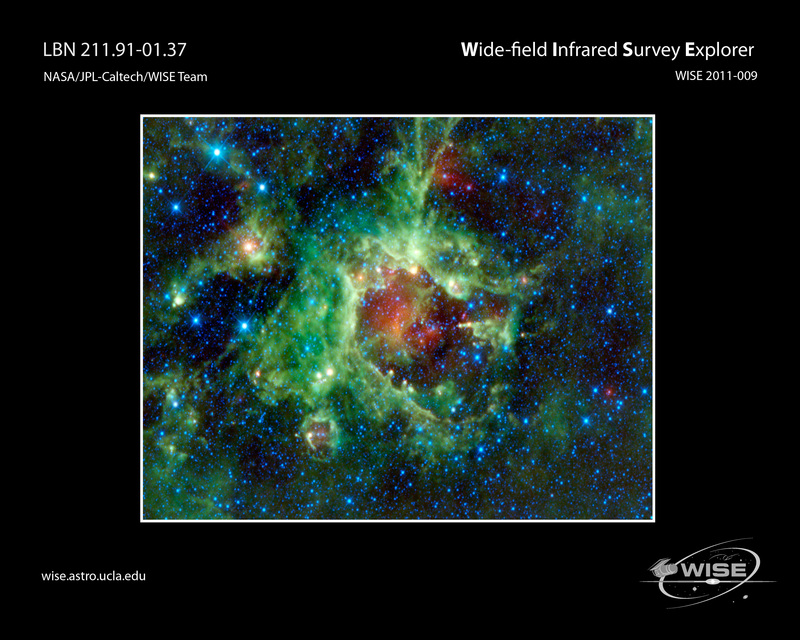 NASA’s Wide-field Infrared Survey Explorer, or WISE, captured this image of a star-forming cloud of dust and gas located in the constellation of Monoceros. The nebula, commonly referred to as Sh2-284, is relatively isolated at the very end of an outer spiral arm of the Milky Way Galaxy. In the night sky, it’s located in the opposite direction from the center of the Milky Way. 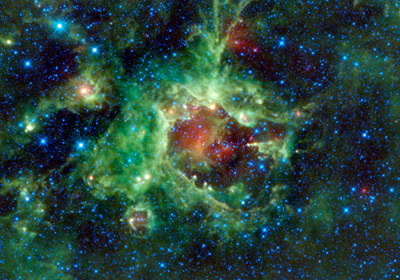 Perhaps the most interesting features in Sh2-284 are what astronomer call "elephant trunks." Elephant trunks are monstrous pillars of dense gas and dust. The most famous examples of are the "Pillars of Creation" found in an image of the Eagle nebula from NASA's Hubble Space Telescope. In this WISE image, the trunks are seen as small columns of gas stretching towards the center of the void in Sh2-284, like little green fingers with yellow fingernails. The most notable one can be seen on the right side of the void at about the 3 o’clock position. It appears as a closed hand with a finger pointing towards the center of the void. That elephant trunk is about 7 light-years long. Deep inside Sh2-284 resides an open star cluster, called Dolidze 25, that is emitting vast amounts of radiation in all directions, along with stellar winds. These stellar winds and radiation are clearing out a cavern inside the surrounding gas and dust, creating the void seen in the center. The bright green wall surrounding the cavern shows how far out the gas has been eroded. However, some sections of the original gas cloud were much denser than others, and they were able to resist the erosive power of the radiation and stellar winds. These pockets of dense gas remained and protected the gas "downwind" from them, leaving behind the elephant trunks. These pillars can also be thought of as rising like stalagmites from the cavern walls. 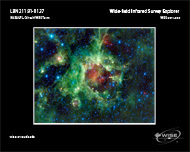 The Sh2-284 nebula is classified as an HII region, as is LBN 114.55+00.22 featured in the September 16, 2010 image. HII regions go hand in hand with star formation, and indeed the stars in the central Dolidze 25 cluster have just recently formed. They’re hot, young, bright stars, with ages ranging from 1.5 to 13 million years -- infants by astronomical standards. In comparison, the Sun is about 4.6 billion years old.